Before we can start to overcome negative beliefs, we need to understand how we got those beliefs in the first place. Beliefs can come about in two ways. Firstly, they can be formed logically as a result making deductions from observations. Secondly, they can be formed when we experience powerful emotions that seem supported by logic, for example, perhaps we failed a mathematics exam as a young child and shortly afterwards one of our parents told us that we were no good at math. From this beginning, beliefs are ingrained into our brains due to repeated exposure to situations which prove their correctness. Once established within our brains, beliefs are accepted as fact and rarely if ever questioned. Once your beliefs are in place, everything you think and feel will be adjusted to agree with your beliefs. Our entire reality as we experience it is a creation of our belief system. This can explain why two seemingly identical people can experience the world so differently. Where one person may be happy to have already achieved so much in their career, another in exactly the same position might resent having achieved so little. Because beliefs are at the very core of who you are, beliefs influence every aspect of your life. Beliefs influence whether you make a good decision or a bad decision, whether you choose to eat well, whether you jump at the chance of giving a presentation or run away from it. Beliefs even determine how you feel about yourself and the labels you give to yourself. In a nutshell, your beliefs will play a large role in whether you are successful or unsuccessful, happy or unhappy, and satisfied or dissatisfied with your overall life experience. Some of our beliefs don’t serve us. Perhaps they were formed many years ago during childhood (such as the failed math exam example given above). They may have helped us during childhood but are no longer relevant today, and are holding us back. 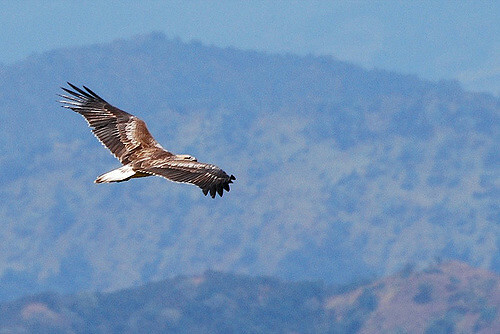 These beliefs are called negative beliefs. They constrain and impoverish our lives. Make a list of what you are good at. Now make a list of what you are not good at. Why are you no good at each of these? Is there an activity you know you should do but haven’t? An activity that you’ve been putting it off for some reason? What is your least favorite work activity? What area of your life is holding you back? Why haven’t you done something about this area already? When meeting new people in a professional capacity, what aspect of yourself, your background, or your personality do you try to hide? In what areas do you avoid helping others? Write down your answer to each question and why you believe this to be the case. Another way you can identify limiting beliefs by listening to the internal monologue going on in your head. Those little phrases and sentences you say to yourself mentally as you go about you day and encounter situations. I don’t – for example, “I don’t do sports” or “I don’t deserve to be successful”. I can’t – for example, “I can’t do math” or “I can’t sing”. I am – for example, the belief “I am intelligent”, might lead us to conclude that “I’m not very good at practical things”. Other negative beliefs might be “I’m rubbish at job interviews”, or “I’m not successful.”, or even “I’m stupid.”. There are many more ways in which limiting beliefs make themselves visible within our internal monologue too. Keep your mind open to catching these thoughts as they happen. Soon you will become very adept at quickly catching these negative thoughts as soon as they occur. I hope it’s apparent how thoughts such as those given in the examples above can really impact the quality of both your life and career. 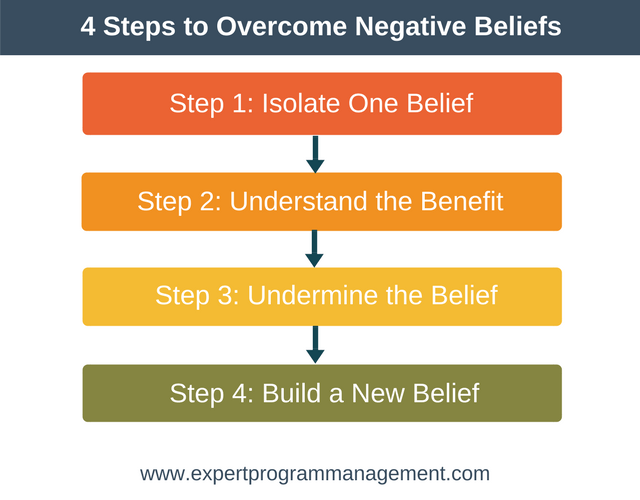 Now that we understand what negative beliefs are and how to spot them, let’s look at a simple four-step process to overcome negative beliefs. The first step in the process is to isolate a single belief that you want to alter. Pick a belief that is limiting your growth and happiness. Maybe you don’t think you’re smart? Maybe you don’t think you’re good enough? Perhaps you don’t think you can give a presentation? Pick just one and write it down. What is the benefit to me of this belief? What price have I already paid by believing this? What price will I pay in the future if I continue to believe this belief? How did I get this belief? Write down all the answers you can think of. If there is no benefit to the belief and you want to replace it with a more empowering belief then move to the next step. Look for examples from your life where the belief wasn’t true. Perhaps you once did well in a math exam, or perhaps you once gave a presentation that wasn’t terrible. Here we’re looking for evidence to help us believe that the belief isn’t always absolutely true. Collect as much evidence as you can before moving on to the next step. Now that we’re beginning to see that the old belief might not hold true in all circumstances, we’ve created the space to allow us to create a new, more empowering belief. But deciding to create the belief, “I’m great at presentations” isn’t enough, we need genuine evidence so our brain believes it. Think of ways you can start to accumulate evidence to reinforce your new belief. If you don’t like public speaking maybe you could start by giving a speech to your partner, or perhaps join a local Toastmasters club where you can practice in a safe environment. If you don’t like numbers maybe you could take a course or spend 10 minutes learning something some new math every day. If you begin by benchmarking where you are then very soon you’ll start to see real progress. The key is to regularly and repeatedly reinforce your new belief. By slowly building the strength of your new belief your results will begin to change for the better. Being attentive to these improved results will further help reinforce your belief and create even better results, creating a virtuous circle of improved results and belief. So in our example of disliking presentations, once we have a few presentations under our belt, we might stop being absolutely terrified and start thinking about our performance – how to use body language, how to effectively use pauses, etc. At this point our confidence has moved away from rock bottom. As our skill further improves we may actually start to like doing presentations. Eventually we might just form the belief that we are great at presentations! Whilst the four-step process to overcome negative beliefs is easy to understand, to implement it properly will take time. You have to reinforce, reinforce, and reinforce your new belief. We’re not talking about simply learning something by rote, we’re talking about trying to retrain our brain, and that takes time. A key takeaway from this article is to remember that by upgrading your beliefs you’re going to increase both your skills and your resilience. An increased resilience is going to make you a better leader, less likely to suffer from stress, and more likely to bounce back from the inevitable setbacks and disappointments that occur on the road to achieving your goals. This article serves as a very basic introduction to understanding how to overcome negative beliefs. If you feel this is an area that is holding you back then there are many books dedicated to the subject. Two of the books I’d recommend are The New Psycho-Cybernetics by Dr. Maxwell Maltz, and Mind Over Mood: Change How You Feel by Changing The Way You Think, by Dennis Greenberger and Christine A. Padesky.